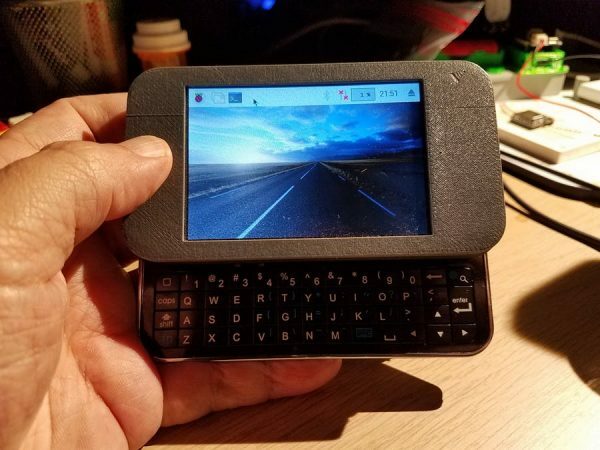 Pi Zero Portable Terminal @Raspberry_Pi #PiDay #RaspberryPi « Adafruit Industries – Makers, hackers, artists, designers and engineers! I was wanting a really portable serial terminal that I could use “in the field” to reprogram ESP8266 modules running MicroPython. Unfortunately there is a definite lack of simple, serial terminal devices to be found on the market, so I decided to build my own. After some consideration and research, I figured the most economical route would be to use a Raspberry Pi Zero, because of it’s small size and low cost. It has a large community and ecosystem as well, with many options for a display that would work for such a small device. Taking inspiration from this project https://n-o-d-e.net/zeroterminal.html I decided to use an inexpensive Bluetooth slide-out keyboard case, for the basis of my device. In my search I found that keyboards for the iPhone 4/4se were rather easy to find so I decided to go that route. So using TinkerCAD, I produced a 3D printed case that would hold all the components and then fit into the case like a phone. Here is the model that I created… https://www.tinkercad.com/things/4x8bYmt6Dwo. The construction of the device was pretty straightforward, the LCD and Pi go in first, and then all of the other components.